Poor Lady. 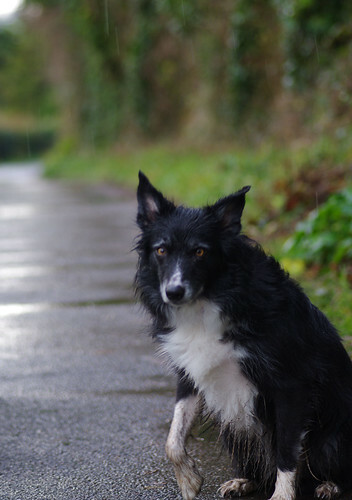 She is let off the lead, expecting a free run, sticks to be thrown and the chance to prove her fetching abilities. But almost as soon as we're inside the gate, things are brought to an abrupt standstill. This was on a tree and too clear to ignore. At last - a lichen I can actually identify! 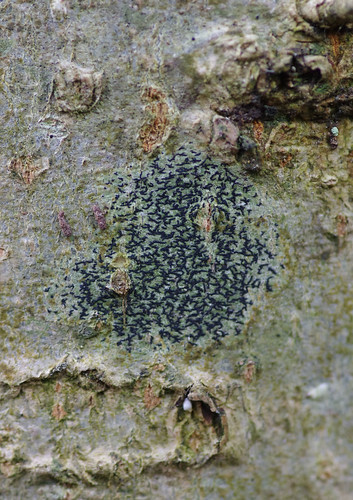 This is widespread on smooth-barked trees but still a good find in my book. 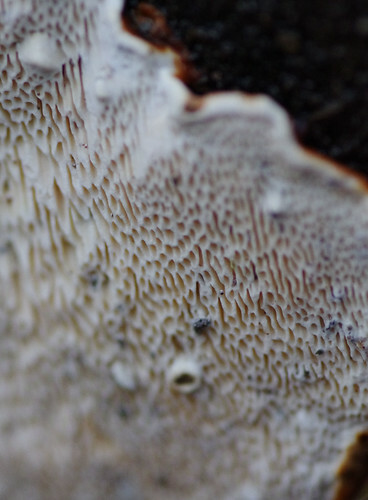 There are a few similar species but the size, shape, thickness and all the other characteristics of the apothecia (the black bits) are just right. Think of it as lichen hieroglyphics. The pattern is probably random but the sentimentalist in me likes to think it must mean something. It was dark in the wood and the camera was selecting those grainy high iso numbers again. But we both agreed it was better to capture things as near to how we saw them as possible. We've seen both this and Root Rot frequently in the last few weeks. 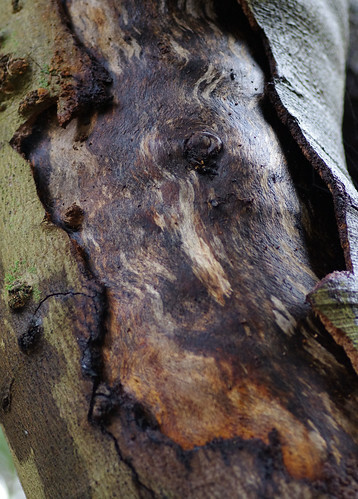 The excessive rainfall may have a knock-on effect next year: more trees infected and killed by fungal rot. 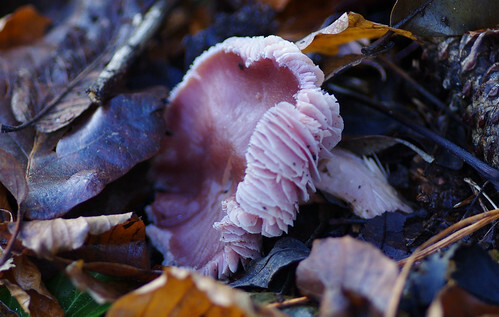 But not all fungi are destroyers and it's important to remember the beneficial role fungi can play to a woodland ecosystem. 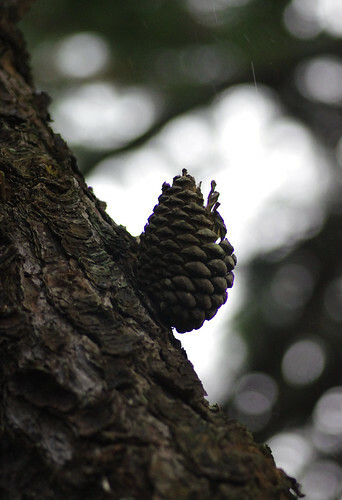 Many species aid the root growth and help of trees underground, through their own numerous mycenium. 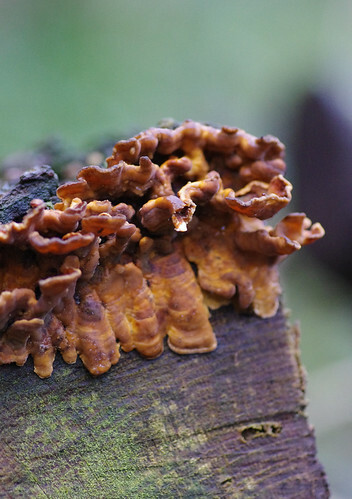 These clustered specimens are relatively young. They will expand and darken with age. These brackets were shaped like pigs' trotters. As yet I have been unable to find a match. 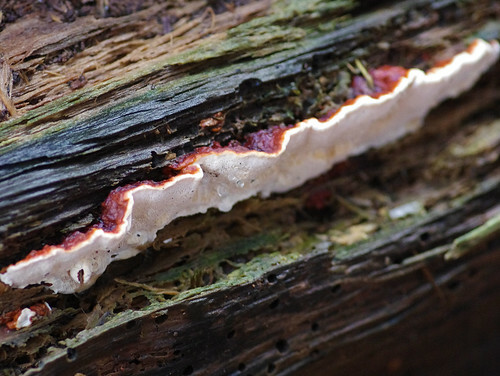 Many bracket fungi are extremely variable and therefore harder to pinpoint. I would guess a squirrel has been nibbling away here although it could have been one of the larger crows. Although, on second thoughts, it could be wishful thinking on my part. Perhaps it is only sodden toilet paper. 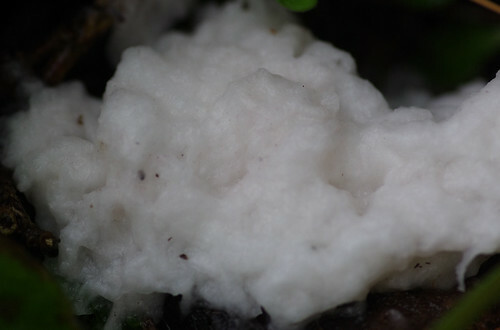 Slime moulds mature and can solidify after many hours. So the obvious way to tell will be to return and see what form it has taken. 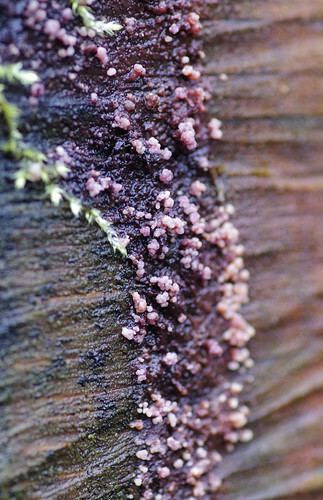 If it really is a slime mould then the structure will have crystallised. With all the heavy rain, sodden toilet paper will have broken up or dissolved. Even with common species, it's great to record them in all their various guises. 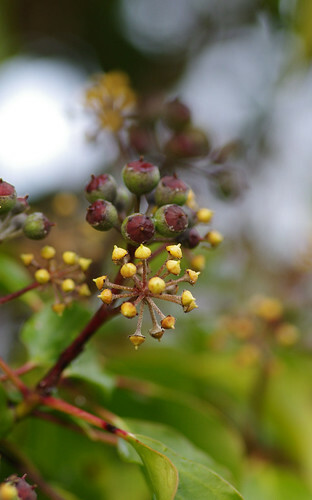 Wasps go mad for these berries in autumn. 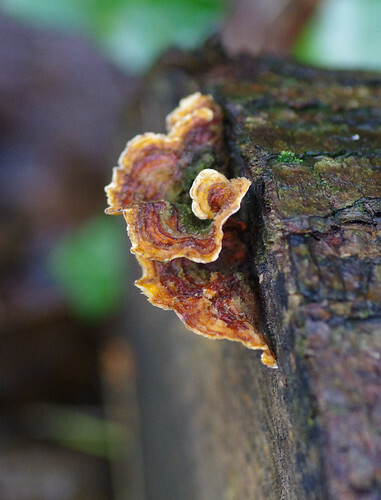 In December the risk of being stung has gone but the textures are still impressive. 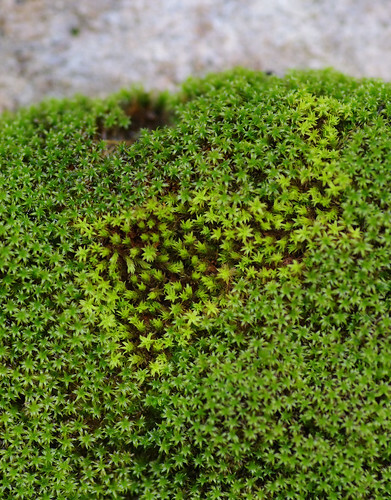 There are not many flowering plants in winter, hence our current obsession with mosses and lichens. Heliotropes are nothing to write home about from a distance. Get a little closer, however and their charms become more apparent. 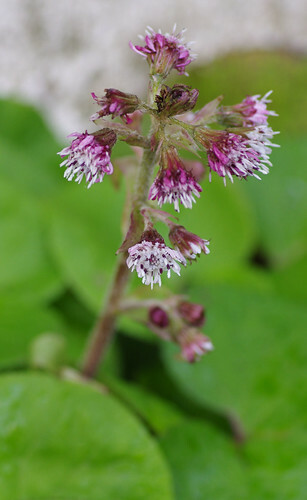 They are frequently to be found along the sides of paths and have rounded leaves. 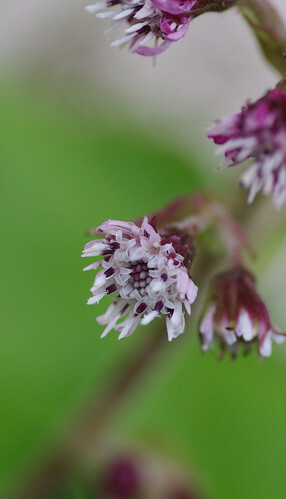 Butterburs are similar but have substantially larger leaves and more flowers per plant. Not more than a few yards away we stumbled upon this bank of mosses at the side of a drive. Judging the colour patterns, we came to the conclusion there were two species here. That was my first thought, at least. Looking through the field guide I managed to whittle it down to no less than four likely suspects but could progress no further. The shape of the fruits helped narrow the options a wee bit. 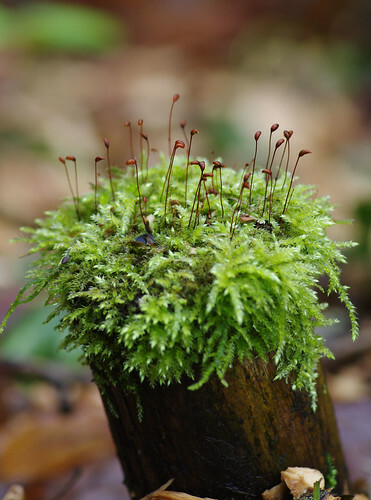 I'm quietly confident the above is Rough-stalked Feather-moss (Brachythecium nutabulum). By now we were soaked to the skin and yearning for home. We went through a new footpath (completed in the summer of 2012) and vowed to return. From there, we only had to negotiate a few steps cut into the hill, a couple of flights of constructed wooden steps and then a few paces back to the car and the end of our woodland foray.